If you are a commercial or residential property owner experiencing drainage issues due to cracks, leaks or blockages in your pipe line system. Trenchless pipe lining may be the most cost-effective and time-efficient solution for you. With over 10 years of experience with trenchless solutions, NuFlow St. Louis’s professional technicians are fully equipped and trained to handle your pipeline issues. Without having to dig up your landscaping or flooring trenchless pipe lining allows us to repair the integrity of your pipelines. This process involves using a blue epoxy resin to coat the inside of the pipe. This allows us to essentially create a new pipe within the old sealing away cracks, leaks, and tree root intrusion. First, our qualified technician will perform a sewer camera inspection. Effectively diagnosing the problem areas within the pipe. Whether the problem is the whole pipe or just a section Trenchless pipe lining can resolve the issue without the use of heavy equipment. Then we clean out the pipes and apply the epoxy coating which inflates until hardened, which can take anywhere from a single day to a few depending on how much of the pipeline needs to be rehabilitated. Not only is the process more cost-effective and less invasive, all of our products are non-toxic and environmentally friendly. At NuFlow St. Louis, we are proud to offer our services to our O’Fallon customers and ensure that their needs are met. What Are The Benefits Of Trenchless Pipe Lining For O’Fallon Homes & Businesses? The benefits of having epoxy resin lining are perfect for water and sewer lines. Epoxy resin is non-toxic and can never leak harmful chemicals into your water. Epoxy resin is also an anti-corrosive and root-resistant substance that, once it cures inside the pipes, increases the lifespan of the pipeline system as a whole. 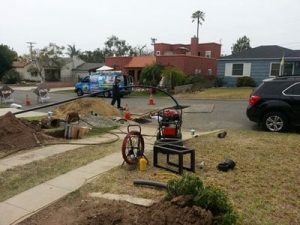 Pipe lining is a fairly convenient process that will not intrude on our customers’ day-to-day activities and schedule. These features that our no-dig solutions offer our customers have helped streamline repairs and encourage home and business owners to be more proactive and maintain their sewer systems effectively. The installation time is fast and doesn’t require homeowners to relocate or have business doors closed for extended periods of time. Call NuFlow St. Louis To Get Your Pipes Relined Today! With over 10 years of experience installing epoxy resin-based pipelines in the O’Fallon area and surrounding communities, our team at NuFlow St. Louis can provide a product that will outlast our competitors and help save you money. When it comes to pipeline repair NuFlow St. Louis, we are ready to fulfill your needs with the most innovative trenchless technology quickly and efficiently. Call us today to learn more about how we can get your pipeline system back on track as soon as possible, and we look forward to working with you!